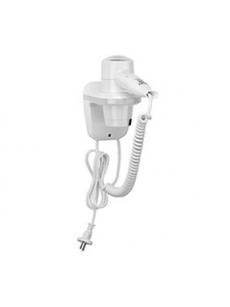 This powerful and long-lasting hair dryer is push-button activated and has a total power of 1,800W. Two heat/speed settings moving the push-button up and down. Position “1” for hot heating and position “2”for warm heating, position "C" cool shot. 9,000-18,000 rpm motor that includes a thermal overload switch. 1,600W heating element that includes a safety thermal cut-out.